Ah yes the timeless Synare, how i've yearned for ye. You've heard them countless times, no doubt, but my favorite has always been Lol Tolhurst's usage on The Cure's Seventeen Seconds. My friend Ryan loaned it to me for a few days and guess what? They're bad as hell! Velocity sensitivity is hard to get used to, but very expressive. All in all its controls are very touchy but it's sound is wild. Click title link to go to two different mp3 sample files I recorded in mono, with no effects, and converted at some hi quality setting (like 224 or something). Kinda large, too (4-5MB each). Enjoy and sample if you'd like! Trip. Didn't realize it was used on The Cure's Seventeen Seconds. Great album. Play for Today is my alltime favorite Cure track followed by A Forest. Just what I was into back then. The first time I saw them live was Head on the Door in Irvine Meadows, CA. It was raining and A Forest was absolutely amazing live. As well as everything else, of course. Oh, and nice shot and samples. Really shows the range of it. Thanks for letting me post the samples. Yeah man that crack on Play for Today is all Synare baby! Mike Hedges is the master engineer too, with all that envelope flanging and chorus on the cymbals. I was surprised how much variety you can get out of these things, like Simmons stuff (but setup more like a regular synth) You can even make 2osc chords with it. I guess I'd prefer a Syndrum-like trigger with external brain module, but this looks cooler! Still it is terrifically overpriced on eBay. If anyone knows where I can find a Synare III drum head replacement, or something else that will work, PLEASE email me (bart.padar@gmail.com) Mine is is super worn out and tearing. I used to have one of these... my drummer took it apart and broke it. 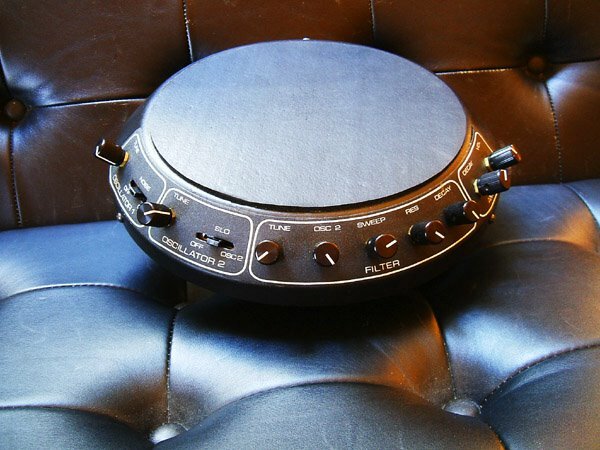 I have one of these synare 3 for sale but I dont know what they are worth. Can anyone help me? I have one for sale, it's in great shape and works great. I will let it go for $425.00. Will send pictures if interested.